A Paradise Valley roofing contractor is the best person to explain to what the significant benefits of a tile roofing system are, but you can learn a little bit about it here too. Arizona tile roofs are very durable and safe. There are a lot of colors and styles to choose from too. There is a kind of southwestern look with tile that you can’t replicate with other roofs. There is a kind of vibe going on there. Peoria tile roofing is best for that southwestern look in Arizona. A lot of people prefer it because of the ambiance it creates in a rustic southwestern house. Tile roofs are very economical if you’re going for steep-slope roofs. The roof is usually constructed of either concrete or clay, and the basic raw materials that go into it are either sand, clay, cement, or water. Sometimes, there is a mixture of all these too. Tile has a unique look. There are literally thousands of color choices available. Tile is one of the most popular options in Arizona. It just fits right in with the culture. It goes back to the old southwestern look. It goes all the way back to the Spanish missionaries. If you have a Phoenix tile roof that has been damaged, the company can also re-tile it and put it back together again. They can even recycle your old roof tiles. They are very generous and economical in how they put it back together again. There is no waste or loss there. Everything is formatted again like new too. Phoenix Arizona tile roofs are the best suited to this area. When people want to add rustic appeal to their homes, they often consider a Wickenburg tile roof. Tile roofing recalls Arizona’s Spanish missionary past when roofs on houses were made from clay tile. Tile still proves to be a popular choice for people who want this unique look for their homes. Clay tiles play up to the area’s southwestern culture and add a colorful appearance to Arizona homes. This material is available in a wide assortment of colors, letting people choose a color that suits their decorating needs for their home’s exterior. Even more, tile fits well within a person’s home improvement budget. Because this material is natural and is abundantly available, tiles can be made and sold for an affordable price. When people want to avoid paying too much for their new roofs, they may choose tile for both its availability and its affordability. They also can enjoy knowing that their roofs will last for many years. Tile is very durable and can withstand even the harshest of weather conditions. It holds up well during hailstorms, rain, high winds, and even ice storms. In the rare instance that a tile shingle breaks, homeowners do not have to worry about losing that shingle altogether. Scottsdale tile roofs are repairable, and a shingle can be put back together or recycled in a relatively short amount of time. Contact Arizona Native Roofing today for your Phoenix tile roofing needs at 602-348-6559. We provide tile roofing services throughout the Phoenix metro area including nearby cities Peoria, Glendale, Scottsdale and the surrounding cities! 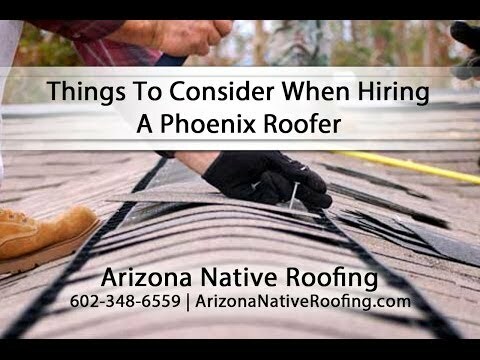 Speak With An Arizona Tile Roofing Contractor Today!